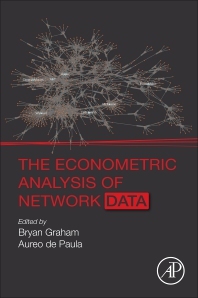 The Econometric Analysis of Network Data serves as an entry point for advanced students, researchers and data scientists who are seeking to perform effective analyses of networks, especially inference problems. It introduces the key results and ideas in an accessible, yet rigorous way, confining formal proofs to extensively annotated appendices. While a multi-contributed reference, the work is tightly focused and disciplined, providing latitude for varied specialties in one authorial voice. Each of the six worked examples describes relevant computational tools and provides a number of illustrative examples that are supported by a companion site code repository. Bryan Graham is a Professor of Economics at the University of California – Berkeley. His research focuses on missing data, panel data and, especially, the analysis of social networks and spillovers. His work has appeared in Econometrica and the Review of Economic Studies. Bryan is a co-editor at the Review of Economics and Statistics. Aureo de Paula is a Professor of Economics at University College London. His research focuses on the econometric analysis of games and networks. His work has appeared in Econometrica and the Review of Economic Studies. Aureo is a co-editor at the Review of Economic Studies.